A standard problem with the objectivity of social scientific theory in particular is that it is either self-referential, in which case it seems to undermine itself as ideology, or self-excepting, which seem pragmatically self-refuting. Using the example of Marx and his theory of ideology, I show how self-referential theories that include themselves in their scope of explanation can be objective. Ideology may be roughly defined as belief distorted by class interest. I show how Marx thought that natural science was informed by class interest but not therefore necessarily ideology. Capitalists have an interest in understanding the natural world (to a point) so that they can manipulate it for profit. Their survival in the marketplace often depends on their competitive success in doing so. The fact that their interventions into nature, driven by class interest, often succeed, is evidence of the reliability and truth of their natural scientific theories. With social science, capitalists have a partial interest in understanding the world, so that they may maintain their class power, ideological hegemony, and a reasonably stable and self-reproducing economy. Some bourgeois social science, Marx thinks, is therefore vindicated the same way that natural science is, because of, not despite, its success in promoting the class interests that cause it. But the capitalist class, Marx thinks, also has an interest in obfuscating the truth about the social world. It would undermine the stability of capitalism, for example, for the bourgeoisie to adopt what Marx thinks to be the correct social theory, Marxism, and proclaim to the world that capitalism is exploitative and unstable. Capitalism creates a a need for ideological social theories that, driven by class interest, represent capitalism as just, natural, inevitable, and unalterable. If Marxism is correct, while these theories may further capitalist interests, they will not withstand the test of time as capitalist exploitation and instability engenders countersystemic political action. How, then can we know, according to Marx, that Marxism is correct, as applied to itself? In part it is whether it succeeds in further the class interests that cause it. If workers adopt bourgeois theories and Marxism is right, they will find themselves frustrated in pursuit of goals that they have, such as improving their well-being, and if Marxism is wrong, then those theories will help them further their own goals. Similarly with Marxism: if it is right, then workers who adopt it should in the long run have more success in furthering their own goals, and if not, then not. But it is question begging to say that our confidence in the reliability of Marxism is enhanced by its successful promotion of goals that capitalists do not have but (according to Marxism) workers do. To avoid this problem it is necessary to compare the relative success of each sort of theory in promoting the interests and needs that the respective classes have independently of the theory, as well as by the usual criteria of scientific theory choice. Thus the Soviet variant of Marxism was fairly decisively refuted by its failure to generate the support of its own designated constituency necessary to grow and survive. Whether the same is true of other varieties of Marxism or of capitalist social theory, it is, as Zhou En Lai said when asked whether the French Revolution had succeeded, too soon to tell, at least in any definitive way. 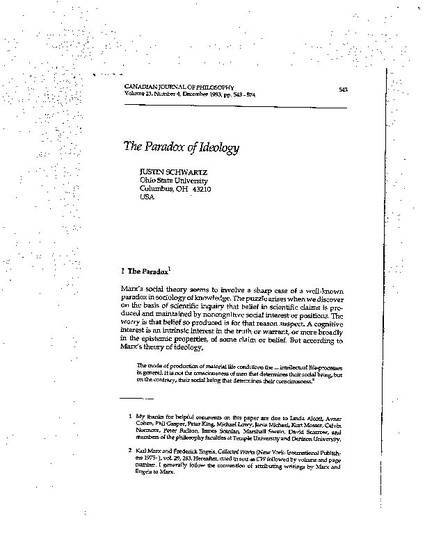 However, and this is the point of the paper, an objective test of Marxism is possible even though Marxism says that all theory is informed by class interest. The question is whether the interests are in discovering or obfuscating the truth. The point is not limited to Marx, but applies to any self-referential social scientific theory that includes itself in its scope.